Type is one of those elements that I use it every day, I could not do my job without, and yet as much as I know about it, there is even more that I do not know. That’s why I find it such a great opportunity to speak with guests like Allan Haley of Monotype Imaging. Allan knows more about letters than I ever will, so it was great to have him on this episode of The Reflex Blue Show. Joined by co-host Ben Lueders, we talk about Monotype Imaging, web fonts, how to become a type designer and the hardest letter in the English alphabet to design. We also speak a bit about his 2012 HOW Conference presentation (Allan is one of the speakers) coming this June in Boston. We’ll be back in two weeks recapping the ads from some football game. See you then! Download The Reflex Blue Show, Season 5 Episode 2 or, click here to subscribe to The Reflex Blue Show from the iTunes Music Store. On this week’s episode of The Reflex Blue Show, Donovan, David Kadavy and I discuss — at length — Adobe’s new Font Folio Education Essentials, and scarcely anything else. Type fans grab a cold one, but type-snobs are advised to skip the majority of the recording due to the vast levels of typographic ignorance on display here. We do manage a fairly thorough discussion of font-pricing and value, as well as cover the AFFEE from top to bottom. 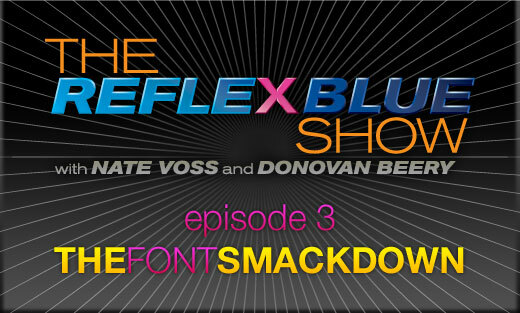 Download The Reflex Blue Show with Nate Voss and Donovan Beery, Episode 3 (23 meg) or click here to subscribe directly from the iTunes Music Store.